The agreement was negotiated for Conmebol by FC Diez Media, the joint venture between IMG and Perform Group, and was signed today by Qatar Airways group chief executive, Akbar al-Baker, Conmebol secretary general, José Manuel Astigarraga, and Qatar FA board member Ahmed al-Buainain. 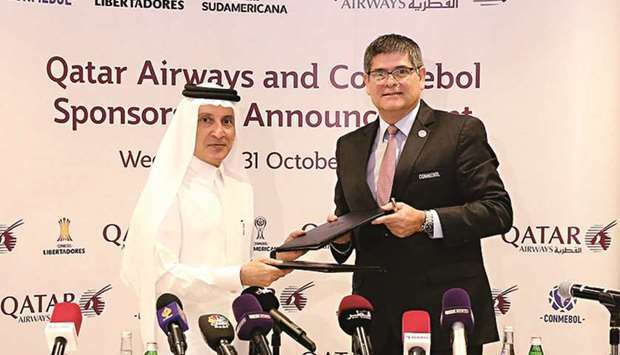 Qatar Airways will be the first-ever airline partner for Conmebol’s club competitions with the sponsorship covering 260 matches starting with yesterday’s Copa Libertadores semi-finals. The airline will also be the presenting and sole partner for the Recopa Sudamericana, the home and away fixture between the champions of the Copa Libertadores and the Copa Sudamericana. The airline has made expansion steps in South America, acquiring 10% of South American LATAM Airlines Group in December 2016. It is already the Official Jersey Sponsor of Argentina’s Boca Juniors until the endo of the 2022/23 season, but the Conmebol deal significantly elevates its football activity on the continent. Last year Qatar Airways became the Official Partner and Official Airline of FIFA until 2022. Described as one of the biggest sporting sponsorships in the world, Qatar Airways extensive marketing and branding rights at the 2022 World Cup Qatar, as well as becoming the Official Airline Partner of the FIFA Club World Cup, the FIFA Women’s World Cup, the FIFA Under-20 and Under 17 World Cups, the FIFA Beach Soccer World Cup, and the FIFA Interactive World Cup. The airline is also a sponsor of Bayern Munich and AS Roma. Qatar’s national team will compete in next year’s Copa America – Conmebol’s flagship national team competition.